This has been our favorite new meal this summer. We can't get enough of it! It's also good with a bit of zucchini or yellow squash. Heat outdoor grill or stovetop grilling pan (depending on the weather!). In medium skillet, heat about 1 T olive oil over medium-high heat. Chop pepper and onion into large pieces and add to pan. Peel carrots and julienne and add to pan. Season with salt, black pepper, and chili powder. Sautee pepper and onion until tender and browned. While pepper and onion are cooking, grill chicken until cooked through and slightly blackened. When chicken is done, remove and slice into thin strips. 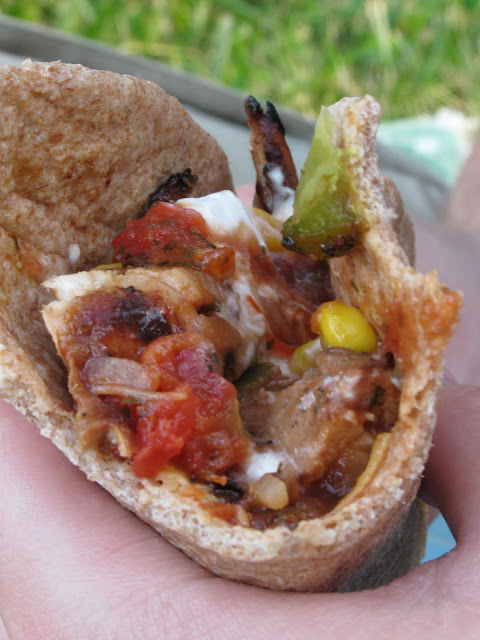 Fill tortillas with a few pieces of chicken and some of the pepper/onion mixture. Top with desired toppings (i.e. cheddar cheese, salsa, sour cream, etc.). Roll up and enjoy! I get asked a lot about my freezer jam recipe. Well, let me tell you—it's easy. I buy the No Sugar Needed Sure-Jell pectin (in the pink box) and use the Quick and Easy Freezer Jam recipes included. Contrary to the label on the box, you do need sugar, but it's a lot less than a typical recipe. The directions are given in minute detail; as long as you follow them to the letter, you will get perfect jam every time! For my last two batches of jam, I also went off the beaten path a little and substituted some mild-flavored clover honey for some of the sugar. (I would have done all, but I didn't want the honey to overpower the fruit. As it is, it adds a nice sweetness and mellow undertone.) In both jam batches I made (strawberry-raspberry, and peach) I put in half the sugar called for. Because honey is slightly sweeter than sugar, I didn't put in quite as much honey as sugar; the general rule of thumb is to replace sugar with honey at a 1 cup to 3/4 cup ratio. So for a jam that called for 3 cups sugar, I did 1 1/2 cups sugar and about 1 1/8 cup honey. For a jam that called for 2 1/2 cups sugar, I did 1 1/4 cups sugar and 1 cup honey. The only other change I made was to decrease the water by 1/4 cup and boil the honey/sugar/pectin/water mixture for 3 minutes instead of 1, to account for the extra moisture in the honey. Both jams ended up with a great taste and a nice firm set. So go out and buy yourself some fruit and No Sugar Needed Sure-Jell! Freezer jam is really one of the easiest recipes around! So there you have it... Cindy's Science of Jam Preparation. This may not be the way that works best for you, but as for me and my house, this makes the best jam on earth! It's jam season. Do you know what that means? I want to eat jam. All. The. Time. And, though my awesome 5-minute boule is good for many things, it's not a fabulous bread to have with jam. I like to have a good whole wheat sandwich bread on hand for my jam sessions. The problem? Until this week, I didn't have the "perfect" whole wheat bread recipe—my basic Whole Wheat Sandwich bread took too long and wasn't amenable to storing (which means no fresh bread every morning! ), and my 100% Whole Wheat sandwich bread had too many ingredients and wasn't quite what I was looking for anyway. Enter my decision to try to make my OWN 5-minute bread stored dough recipe! I've spent enough time reading and making the recipes from "Artisan Breads in 5 Minutes A Day" that I figured I had a pretty good handle on what elements were essential to the stored dough process. 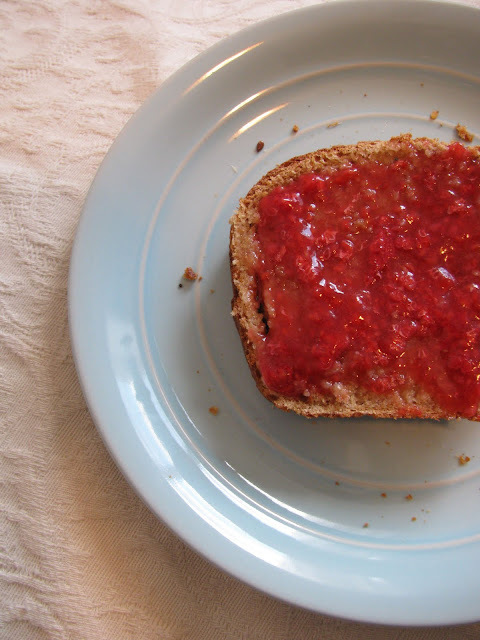 Accordingly, I took my beloved Whole Wheat Sandwich Bread and tweaked it until I ended up with what is, in my opinion, the BEST jam-friendly bread EVER! So here, for your culinary pleasure, is my very own bread recipe. In a large bowl or stand mixer bowl, combine water, yeast, and salt. Add oil and honey and mix a little bit. Add in flour (holding back the last 1/4 cup to make sure your dough is not too dry) and mix ingredients together. Dough should NOT form a ball, and should still be fairly sticky, but you want it to be oozy, not runny! If needed, add more flour. Transfer into a 5-quart plastic container (or a metal bowl lined with wax paper/freezer paper/plastic wrap). Obviously, if you have a mixing bowl that is at least 5 quarts and plastic, you can do this all in one bowl! Cover with something that is not airtight (but DON'T use a towel, or the dough will stick to it... trust me!) and let rise for 2 hours on a draft-free countertop. At the end of the 2 hours, you can shape a loaf or store in the fridge. When you are ready to shape a loaf: Grease loaf pan. Sprinkle flour liberally on top of dough, and get plenty of flour on your hands. Remove a section of dough about the size of a canteloupe. Work into a loose ball (dough will not hold shape very well; that's okay). Set in bread pan. Turn oven to 375 degrees. While oven is heating, let dough rest for about 40 minutes if it has been refrigerated (if it hasn't been it doesn't really need any resting time at all). Just before baking, combine about 1 t. water with 1/2 t. cornstarch. Brush over top of loaf. Sprinkle with desired toppings (oatmeal, seeds, nuts, whatever you feel like—my favorite combination right now is flax & poppy seeds.) With serrated knife, slash loaf three times diagonally across the top. Place on top rack in oven and bake 40-50 minutes, until the top of the loaf is a deep brown and sounds hollow when tapped. Let cool on a rack. Enjoy with butter and your homemade freezer jam! Now pardon me, I have to go eat the rest of the loaf clean my kitchen. Yield: I like to use medium-sized loaf pans, which take a fair bit of dough. I estimate that this amount of dough will probably make 2 medium loaves and 1 small loaf, depending on how much dough you use. 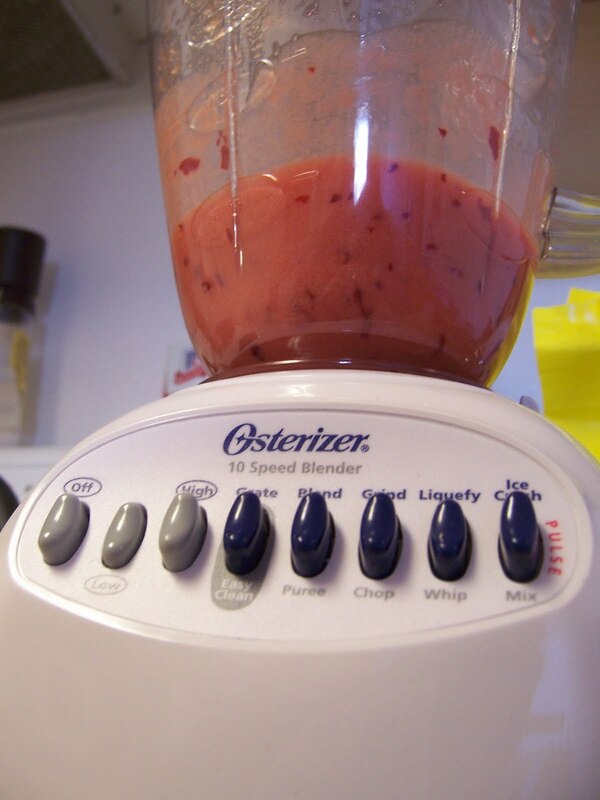 The recipe can easily be doubled if you have a big enough container (10 quarts or more). *Extra healthy tip: I have also made this bread recipe using nearly all wheat flour (5 1/2 cups wheat, 1/2-1 cup white) and it works great, especially if I give the dough a little extra resting time before baking it. After much experimentation, I think my favorite flour combo is: 5 1/2 cups of wheat flour, 1/2 cup white flour, and 1/2 cup rolled oats. DELICIOUS!